So, here's what you do. Start the grains on the stove top, add all the liquid at once, cover, and transfer to the oven for the better part of an hour. If you have a medium/large oven-proof casserole, like a Le Creuset, you can go start to finish in the same pot/casserole. Although, I can't remember if the knobs on the lids of Le Creuset can handle a 400F oven? It may be too hot - you may still need to use foil to cover the pot. Calling this a risotto is a bit of a stretch, it's not particularly creamy or loose. It won't run across a plate. But when I make it on a stove top, I use a risotto technique, so that's sort of how I think of it. If you think you might like a more oozy, cheesy version, use small cubes of good mozzarella in place of the Parmesan in the recipe below, or experiment with a blend. I mean, it's cheese - you can make it as cheesy or un-cheesy as you like. I was after something with cheese, but not over-the-top decadent here. You can bake this in an oven-proof casserole. As far as grains go, I used semi-pearled farro, but I can imagine making this with semi-pearled barley as well. Beyond that, arborio rice would be an logical and easy-to-find alternative. Different grains will likely affect the consistency of the risotto in the end, some might end up drier or more fluid, but you can adjust the baking time accordingly, and I don't think you'll be too far off using this amount of broth/water. Preheat oven to 400F / 205C, with a rack in the top third. Rub olive oil across an 8x8-inch baking dish, or equivalent, and sprinkle with lemon zest. In a large saucepan over medium-high heat combine the olive oil, onion, and a couple pinches of salt. Cook until the onions soften up and begin to become translucent, a few minutes. Add the farro, stir until well-coated, and cook for another minute or two. Stir in the tomato sauce and the broth. Bring just to a simmer, remove from heat, and stir in about 3/4 of the cheese. Carefully taste a bit of the brothy liquid, and adjust the seasoning if needed. Transfer to the prepared baking dish, cover with foil, poke a few slits in the foil, and bake for about 45 minutes or until the grains are cooked through. 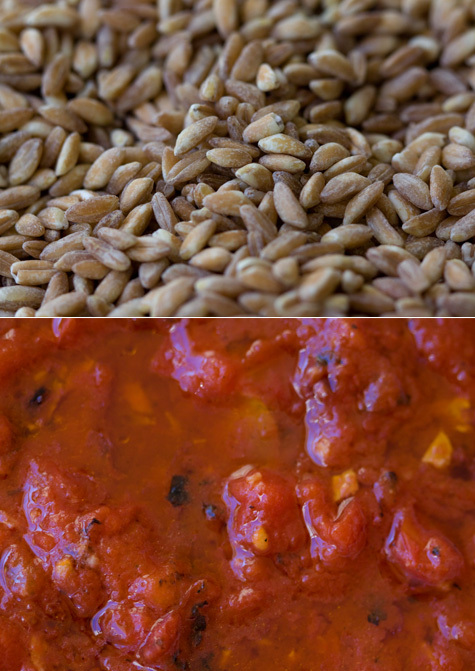 You can uncover in the last few minutes to get a bit of color on the top of the farro. Alternatively, you can brown the top carefully under a broiler for a few minutes, which is what I did. Serve sprinkled with the remaining cheese, the fresh oregano, and a drizzle of good olive oil. *You can use your favorite tomato sauce here, but the following sauce is easy to make from scratch. It is bright and vibrant tasting - perfect to play off the grains. Heat 2 tablespoons of olive oil in a saucepan over medium-high heat. When hot, stir in a clove of garlic smashed into a paste with a couple pinches of salt and 1/4 teaspoon of red pepper flakes. Cook just until the garlic starts to take on color, not more than 10-20 seconds, and stir in 1 cup / 8 oz / 225g of crushed tomatoes OR crushed fire-roasted tomatoes, from a can. Simmer for a few minutes more and remove from heat. Taste and add a bit more salt if needed. I made a big pot of farro & bean stew for my mom and dad the other night - simple, hearty, and straightforward. The stew has farro, beans, lots of vegetables, and a generous dusting of cheese to top each bowl.